Free Printable Earth Day Crossword Puzzle Puzzle. 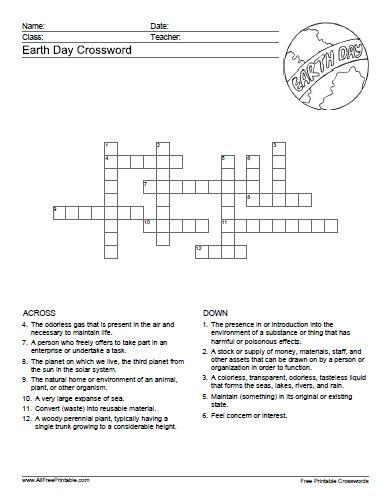 Earth Day Crossword Puzzle, a Free Printable for kids lo learn at home or at the school Earth Day Celebration. Find fun Crossword Puzzle games here. Print the Crossword Puzzle with your home inkjet or laser printer and teach kids about Earth Day solving the 12 words crossword. Earth Day Crossword Puzzle includes related words like Preserve, Recycling, Water, Resources, Oxygen, Volunteer, Pollution, Care, Earth and many more. Click the link below to download or print the free Crossword Puzzle Game now in PDF format. Crossword Solution Included.